Mouth-watering, realistic dollhouse foods and beverages are Carolyn McVicker's specialties. 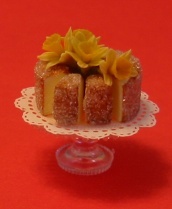 Her attention to detail is always evident in her well-known special miniature creations and she is renowned for her turkeys, hams, wedding cakes, desserts, and cocktails. 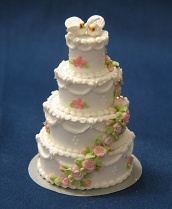 Some of the hundreds of items she replicates are miniature fruits and vegetables, dinners, breakfasts, desserts, as well as miniature beverages including miniature beer, wines, and cocktails. Carolyn makes several sizes of dollhouse foods ranging from one-inch scale down to quarter-inch scale. She also has miniature holiday themed food and beverage items ranging from punchbowl sets to desserts. She has miniature baskets filled with fruits, vegetables, grapes, or wine and cheeses, along with food boards and tables showing dollhouse food in various stages of preparation. As an I. G. M. A. Artisan, Carolyn McVicker is proud to create authentic miniature food items in various periods of time including, but not limited to Tudor, Victorian, Colonial Williamsburg, Modern and Classical. She welcomes custom work and special orders. She is proud to present her items at retail dollhouse shows and NAME Regional Houseparties and National Conventions. Her wholesale miniature foods and beverages division, MCM Enterprises, serves many customers and miniature Wholesale Trade shows such as CIMTA. 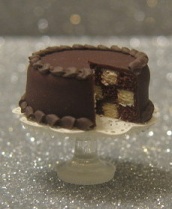 Carolyn loves to create miniature foods and beverages for special orders from customers.